Hello friends if you are just started play 8 Ball Pool game for the first time or you just want to learn or need a guide for few new tricks to improve your 8 ball pool game, well we’ve here all 8 ball pool guides you want to learn. In that We’ve also added some questions we get frequently asked by our user many times on our Facebook pages and on Twitter. We have also got tips from the best: gamer who have sent us their advice and share experience on how to become a top 8 Ball Pool player. In 8 ball pool to call a pocket all time you have to do that click the pocket in which you want to pot the ball. There is some of the mid-ranked tables user require you to call the pocket on the 8 Ball. And higher rank tables need you to call a pocket for every ball. Running out of time: In 8 ball pool there is a limited and short time to take a shot. so play your shot in that time and don’t take long and passes game to the other. In 8 ball pool the play time gets a little shorter after every ball you pot. The Cue ball not hitting your own balls: When you play the game be alert the white ball doesn’t hit your own ball before hitting the other player ball. If it touches your own ball or miss the shot it’s a foul. No ball hitting the rail: When you the game to prevent the negative play, you have to hit the object ball or the cue ball hit the rail around the any edge of the table. 8 Ball potting: There are some following situations are fouls, and the result in that other player will declare as winner. All your object ball is not potted and you potting the 8 ball this is a foul. Potting the 8 ball and the cue ball same shot. Potting 8 ball after any other colored ball on the same shot. 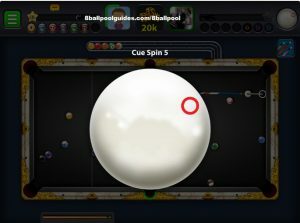 In 8 ball pool you can move cue ball anywhere in the space to the left of white line, if you get to break off. In any shot you pot one or more balls during your turn you get another turn. Where is, the table will remain “open” so you can choose if you want pot the spots or stripes. However, any striped or spotted balls potted during break won’t count until you pot either pattern during your next turn. In 8 ball pool if you have ball in your hand can move the cue ball anywhere on the table. With the help of mouse you can move the cue ball anywhere. In mobile you can drag the ball on the table. When you take a shot in 8 ball pool table the spin can help to get better position of the cue ball in your next turn. User can put spin on the ball by red symbol on the cue ball using arrow keys or by mouse. In mobile you have to move the red circle on mobile screen tab the cue ball for the moving ball in spin direction. In 8 ball pool game you can challenge your Facebook friends and to challenge your friend you’ve to linked your Facebook account with the Miniclip accounts. In the 8 ball pool game you can search any user or your friend if you know their Username in the game. NOTE: You can find a player in search if he is online. In 8 ball pool can search using user IDs (Mobile only). By clicking on plus sign you can add a player. In 8 ball pool you can earn 25 coins every 30 mints on Web and 1 hour on Mobile. Tap of the Free Coins button to get the coins. In that you can also watch short adverts to earn coins. 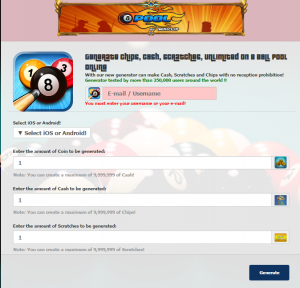 To make free coins we make 8 ball pool Coins and Cash generator tool. With 8 ball pool Coins generator you can generate the unlimited cash and coins free. You have followed just few steps to generate the cash and coins. Step 1 . Open your web browser on PC or in your mobile. Step 2. Click on the link of 8 ball pool coin and cash cheats generator. Step 3. When the generator is open then enter your USERNAME or E-MAIL ID. Step 4. Select your platform which are you using like Android ,IOS or Windows. Step 5. Enter the amount of Coins to be generated. Step 6. Enter the amount of Cash to be generated. Step 7. Enter the amount of Scratches to be generated:. Step 8. Then click on the Generate Button to start the process. Step 9 . The process will be started for checking the your username and your platform. Step 10. Now it will connect to server for 8 ball pool cheats generation. Step 11. Then click on forward button to next process. Step 12. Now your account is verified and check your account or game coins and cash are generated. Step 13. If it Shows ACCOUNT IS NOT VERIFIED then you have to verify your account manually. Step 14. To verify your account you have click on VERIFY button within the given time period. Step 15. It will show you some offer or survey for Human verification. Step 16 . To get verified your account you have to complete the human verification process. Step 17. After complete the all process restart your game Enjoy with unlimited Cash ,Coins And Scratches. Thanks or you can watch the video for more help.